Hamilton Hall draws the commuter crowd. The pub serves a choice of ales and traditional pub fare. There is a cashpoint machine inside the pub. Entertainment at Hamilton Hall includes fruit and quiz machines. In fine weather additional seating is available on the terrace area. Do you work at Hamilton Hall? What did you think of Hamilton Hall? Update on my previous review. After a 6 week major refurbishment it looks different to previously with the small step removed on entry/exit which took some people by surprise if not aware of it. The real ale is still kept 1st class condition ( I'm glad to say ). The staff are very smart in their new uniforms and still just as friendly and efficient as ever. Hamilton Hall is situated just outside liverpool street station. 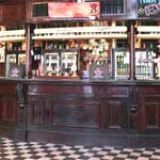 Whether you be a commuter looking for a few bevies after work, passing through or looking to line you stomach before a heavy night then look no further as Hamilton Hall offers all, and at more than a reasonable price I might add. Like every wetherspoons, drink and food offers a plenty. With its high ceilings and ornate decor Hamilton Hall provides a spacious environment in which to drink. The staff are always reasonably friendly and provide a fest service meaning you wont be standing at the bar for long. I haven't got anything bad to say about Hamilton Hall, yet at the same time there's nothing that leaps out and grabs your attention either, its very much run of the mill. Yes the staff are friendly and provide a quick service, and yes the food and drink is good value for money. But like every weatherspoons there seems to be a lack of something. Atmosphere! However with all that aside if your looking for a place that's well located,convenient, allows you to eat and drink to your hearts content minutes before your train departs and still have change for the taxi ride home , then you cant fault Hamilton Hall, or even if your looking for a place to start the night rather then end it then I couldn't think of any where better. This converted ballroom outside Liverpool Street station has more glitz and glamour than a commuter chain pub should really have any right to. For what is ostensibly a Wetherspoon's pub in a train station, Hamilton Hall is quite fabulously extravagant and architecturally impressive. Situated on the Bishopsgate concourse of Liverpool Street station, the venue is literally a vast “hall” that used to serve as the ballroom of the now-defunct Great Eastern Hotel, and is decorated to the hilt with gold leaf, plaster-cast seraphim and cherubim, vaulting windows and elaborate chandeliers. To these ornate surroundings, the management have added bookshelves, some truly unfortunate carpeting and a whole wall’s worth of fruit machines. Seating, in the form of padded chairs both high and low, is ample, and even at peak hours the semi-circular bar is wide enough to accommodate everyone. An upstairs level with its own scaled-down bar acts as a more subdued dining space, and there is a wide-ranging outside area prior to the main entrance which looks out on to the mayhem of Bishopsgate. 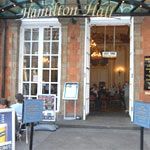 Any atmosphere generated by the busy clientele is swallowed up by the cavernous design of the Hamilton, although it is certainly a much-appreciated stop-off point for local businessmen, and the outdoor area in particular provides an oasis of calm in the rush hour storm. The framed TVs displaying train departure times only serve to emphasise the sense of impermanence around the otherwise spectacular room, but for commuters in transit, the Hall is a pleasant and ideally-situated location for a couple of post-work drinks. The menu offers up standard Wetherspoon's fare, with lacklustre curries, wraps and burgers usually offered in conjunction with free drinks and sides. Not particularly inspiring or even that cheap, due to the expensive surroundings – a curry and pint costs £6.75, and mains are anywhere between £6 and £9 – but certainly varied and substantial enough to tide you over through a long train ride home. The drinks list is equally perfunctory, but does its job perfectly well. Amstel, Carlsberg and Tuborg on draught (at roughly £3.40 a pint) all share bar space with a standard selection of ales and spirits, as well as a fairly decent wine list – the cost-to-quality ratio leaves a little to be desired though. Again, suitable for those just passing through - which accurately describes about 90% of the Hall’s clientele. A visually stunning venue that belies its chain pub origins and undesirable location, Hamilton Hall is an interesting architectural curio but doesn’t offer a whole lot else in terms of service, food and drinks. Excellent interior design that is fitting for the City. The price of the drinks are excellent too for the location.